All about diamond ring designs! The fascination with diamond rings for women and gold ring design without stone is a never-ending one, from ancient Romans believing diamonds being a teardrop of god to cocktail rings being rocked in the 1970's, ladies gold ring and finger rings gold obsession has really come a long way. Diamond Rings today is a luxurious necessity to the fashion forward, they are beautiful accessories that provide a much needed or a well added grace to any attire. The easiest way to find the trendsetters in gold ring for women with price and diamond rings for girl is right here at papilior. Rings for women come in a variety of affordable as well as luxury price range from anything between INR 7500 to find elegant gold ring design for female to INR 65,000 to find luxurious diamond ring design for female, the gold ring price also depend upon your choices in 14k or 18k gold, the diamond cut color clarity & making charges. All diamond ring designs you see are crafted and manufactured in-house designed keeping in mind the current trends. While diamond gold rings for women would be considered only as a gifting option a decade back, today is a way of life for independent women everywhere. 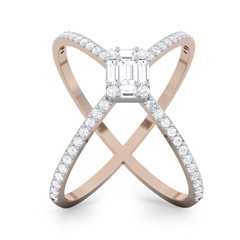 With gold diamond rings available online Papilior.com has set a trend with its designer collections and made it an easy experience for the users with the affordable diamond rings for women price. 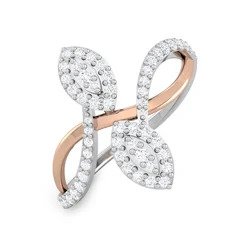 Rose gold rings have grown to be a popular type of gold ring for girls with designs like Jonquil ring gracefully made as a tulip bud with diamonds studded in a thin band apt for a young girl. Love for white gold diamond rings as wedding rings have inculcated and seeped into the fashion stream in the past decade or so, and today gold wedding rings and ladies diamond ring are the most bought jewelry. Find the best diamond gold ring design for female on papilior with 10 + collections to browse.